Giving away art. One of the annual real-world experiences we do is a bit zany –right in the heart of winter, each student selects their best or favorite work of art created that year and we travel downtown. In the midst of rush hour we parade our fine wor ks of art around in what I have now dubbed, “The Walking Gallery”. 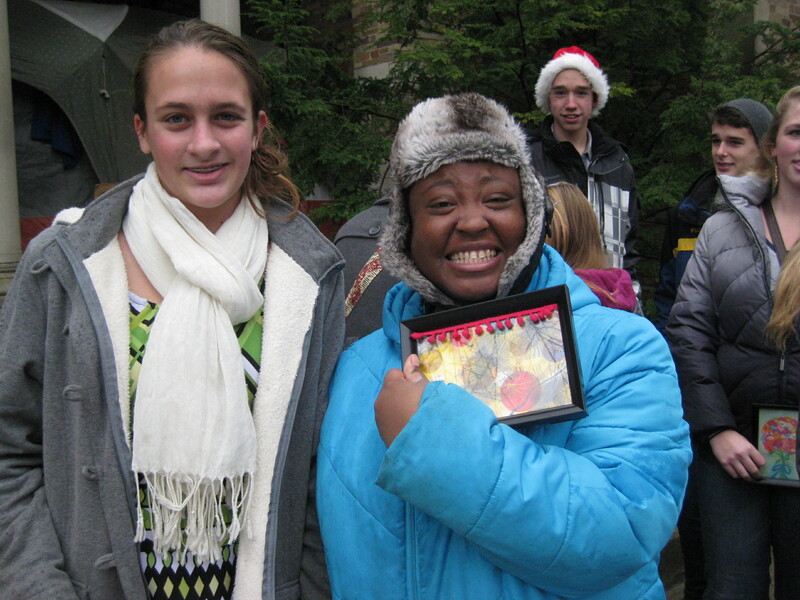 Students even get extra credit if they hand out some packaged “crackers and cheese” to a morning pedestrian! I changed things up a bit this year, and found it very successful -students spent two days creating a 5″x7″ work of art to give away. As we walked downtown we told the pedestrians, coffee baristas, security guards, businessmen and homeless street people that we were giving away free art. It was amazing to see so many shocked at the thought of giving away art. Out of the 24 students 2 were not able to give theirs away in the 35 minutes we walked downtown, so we hung them in a tree branch with a sticky note that said, “Free”. Here is a newspaper article on our experience. 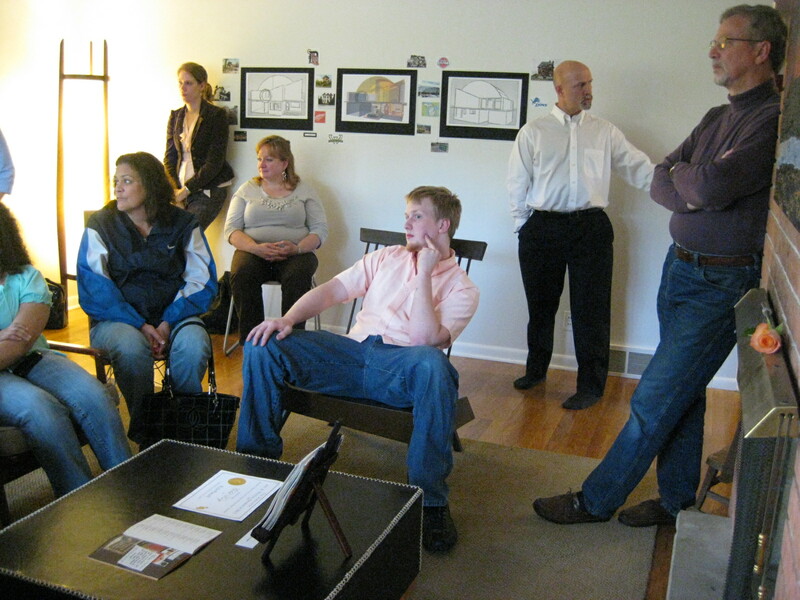 Aside from the large group J-term experience I offer for students to visit art studios and design firms, I encourage students to present their work to local artists for feedback. 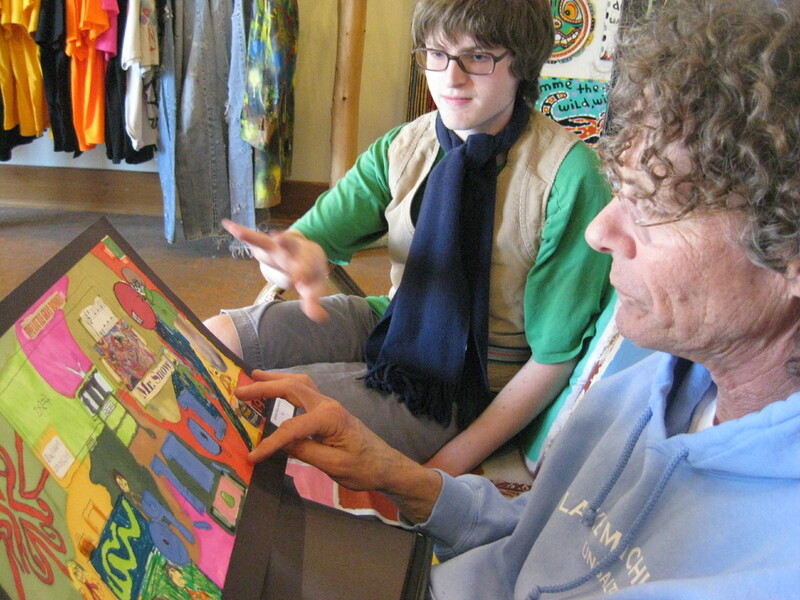 One student whose work really reflected the spirit of Sanctuary Folk Art had the opportunity to talk about his work to Reb Roberts, artist and owner of the gallery. Here is a short video. Our school is always in search of ways to connect the high school students to the elementary children. I decided that instead of self-portraits this year, students would use the grid system to create portraits of two elementary 1st grade classes. Both the older and younger students were very excited about the project. 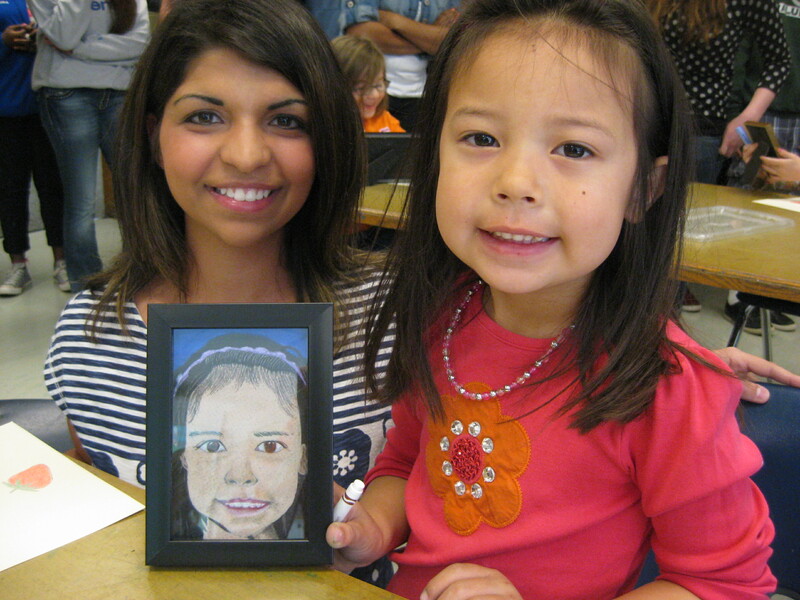 I also want to consider inner city school children portraits or veterans for future years. Any opportunity you can find to showcase Senior work would be a wonderful way to “send” them off to the real-world of art. We owned an art gallery so it was an obvious choice, but even if you do not, maybe someone you know does, or you can ask a gallery. Otherwise ask a coffee shop, small business owner, or even at your own home (which we have had students do with success too)! Have it be a solo show or small group show, have them hang their own work and title cards, make invitations and bring the desserts!